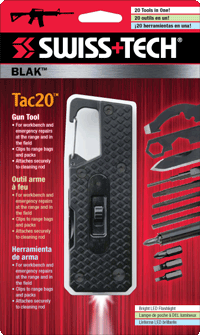 The BLAK Tac20 Gun Tool is a fold-out tool designed for military, law enforcement officers or civilian gun owners. 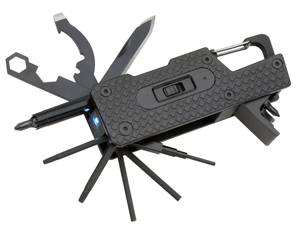 This 20-in-1 multitool includes three screwdriver bits, a bit storage compartment, 3/32-inch punch, 8-32 male thread connecter, 9/64-inch Allen driver, 1/8-inch Allen driver, T15 Torx driver, T10 Torx driver, A2 sight wrench, #1 Phillips screwdriver bit and a magnetic ¼-inch bit driver socket. Also included are an LED flashlight, knife, 3/8-inch hex wrench, ½-inch hex wrench, a castle nut wrench and a large flat screwdriver. The textured aluminum is easy to grip and the carabiner clip attaches to a key ring, belt loop or bag. 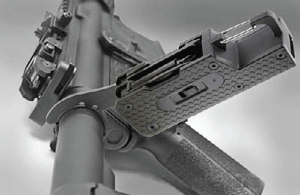 Its durable, compact design fits easily into a pack or range bag. Product Size: 5.00” x 1.50” x 7.00"